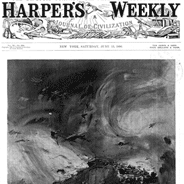 Just after 5:00 p.m. on Wednesday, May 27, 1896, the thick, low clouds hanging over St. Louis began to swirl ominously and turn a greenish hue. The barometer dropped quickly, and rain began to fall in large droplets as people quickly rushed to take cover. Within moments, a tornado of tremendous proportions swept a wide path through St. Louis and crossed the Mississippi River into East St. Louis. 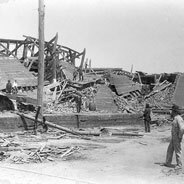 The tornado, known as the Great Cyclone, cut a ten-mile swath of destruction that completely destroyed 311 buildings, heavily damaged 7,200 more and caused substantial harm to yet another 1,300. In a mere twenty minutes, 255 people were killed. The St. Louis Post-Dispatch reported that "all over the city, bells were tolling for the dead." 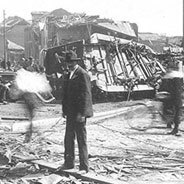 The Great Cyclone remains the single deadliest incident in St. Louis history. 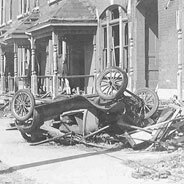 Immediately after the storm clouds cleared, photographers from St. Louis, Chicago, and other cities rushed to the area with cameras in hand to document the destruction. 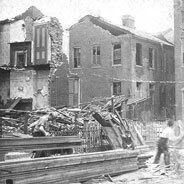 Several studios published paperback booklets with photographs illustrating the carnage left in the wake of the 1896 tornado which served as souvenirs of the event. Numerous examples of these are preserved in the Special Collections Department of Central Library and form the basis of this exhibit. 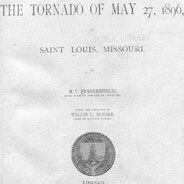 View some examples of the published pictures and accounts of the tornado. 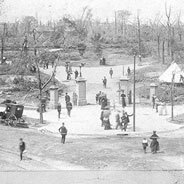 The Lafayette Square neighborhood took a direct hit from the powerful tornado. See the damage caused to St. Louis' residential areas. Many businesses along Jefferson Avenue and South Broadway were devastated by the tornado. Rail transportation was severly affected by the Great Cyclone. 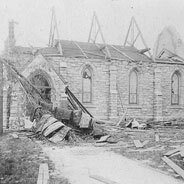 The ruins of many destroyed churches were documented by local photographers. 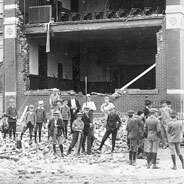 Hospitals, schools, gymnasiums and other city institutions were greatly affected. The U. S. Weather Bureau produced this pamphlet shortly after the tornado. 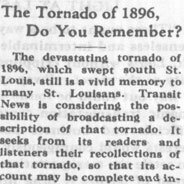 The Transit News solicited recollections (in 1931) of the tornado. View photos of the 1927 tornado that damaged St. Louis.